Superb one bedroom loft apartment with garden views.Bedroom & bathroom in loft, powder room downstairs. Includes queen bed, air conditioning, balcony, kitchen, free WiFi, laundry & ironing facilities, tea & coffee making, flat screen TV & DVD player. Superb one bedroom loft apartment with garden views. Bedroom & bathroom in loft, powder room downstairs. Includes queen bed, air conditioning, balcony, kitchen, free WiFi, laundry & ironing facilities, tea & coffee making, flat screen TV & DVD player. Superbly appointed spacious three bedroom apartment with two queen bed, two single beds, air conditioning, private balcony, fully equipped kitchen, 300 MB WiFi included p/n, washer and dryer, ironing facilities, tea & coffee making, flat screen TV a DVD. Spacious split level three bedroom apartment with city views, 2 queen beds, 2 single beds, air conditioning, private balcony, full kitchen, free WiFi, washer & dryer, ironing facilities, tea & coffee making and flat screen TV. 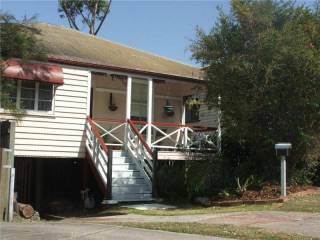 Close to Brisbane CBD. Oxygen Apartments are ideally located atop a hill in Leichhardt Street, Spring Hill affording magnificent views over Brisbane city. The property consists of three separate buildings with a configuration of one, two and three bedroom apartments all with either city or garden views. The property has a large gymnasium which overlooks the sparkling swimming pool area, a solar heated pool, sauna and spa, a lush green garden area, secure guest car parking, laundry/dry cleaning services and 300 MB of WiFi included per night. 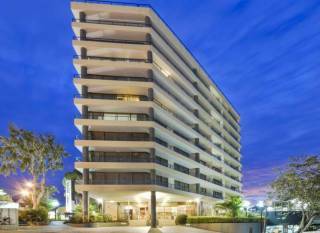 The apartments are spacious and airy with their own private balconies, fully equipped modern kitchens, air conditioning in both lounge area and bedrooms, flat screen TV with Foxtel, washing machines and dryers, DVD players, CD/radios and hairdryers. The one bedroom apartments have a shower over the bath, whilst the two and three bedroom apartments have separate showers in the ensuites and shower over bath in the main bathrooms. One bedroom apartments have queen size beds. Two bedroom apartments have either 2 queens or a queen and 2 singles. Three bedroom apartments have a range of options including 3 Queens, 2 Queens 2 singles and 1 Queen and 4 singles the bedding can be re-arranged to suit your needs. Additional guests may sleep in the two or three bedroom apartments at an additional charge of $30 extra per night. 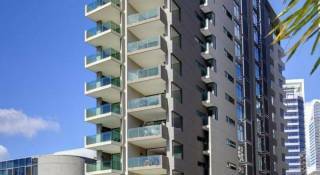 There are three large three bedroom penthouse apartments which have exquisite northern views over Brisbane. 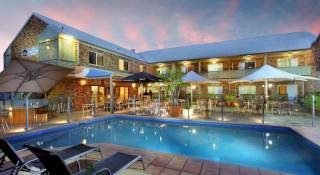 An ideal escape for families or groups for a wonderful weekend escape to sample all that Brisbane has to offer. Brisbane CBD, restaurants and cafes are within comfortable walking distance, as is Central Station, with trains linking you from the Gold Coast, Sunshine Coast or Brisbane Airport. Suncorp Stadium and South Banks Parklands are a short distance away. The fabulous City Cat cruises on the Brisbane River taking you to other local attractions and suburbs which are worthwhile exploring. 1] �Outstanding charges on the account will be settled the day before arrival on the credit card provided at the time of booking unless special prior arrangements have been made. A credit card must be presented on arrival and a $200 pre authorisation must be made upon check in as a security deposit in the event extra charges are applicable. 2] �Occupancy starts and finishes on the dates shown on your reservation. Check In from 14.00 Hours (2.00pm) �Check Out - 10.00 AM - Variations available on request and subject to availability. Late check Outs after 10.00am may incur late check out fee and is always subject to availability. 3] �The Guest will be liable for payment of any charges incurred by any Guest including all replacements and necessary costs for any damage or loss to the apartment and its contents or the Body Corporate property. 4] �The apartment must not be used for any unlawful purpose. 5] �Guests must only park cars in the designated areas, as explained upon check-in. 6] �Only the number of people shown on the booking may stay in the apartment overnight. 7] �No animals or pets are to be brought onto the complex. 8] �Neither the Body Corporate, the Manager nor the apartment owner is liable for any damage or loss of property which a Guest may sustain while within the complex. 9] �The by-laws, rules and regulations of the complex and any reasonable direction of the Manager must be complied with. The apartment must be vacated if after receiving a warning, if any Guest fails to comply. 11] The Manager may inspect the apartment at any time with reasonable notice and at any time �without notice if the Manager is of the opinion that there has been a breach of these conditions. 28]Internet - 300 MB per day of Internet access via WiFi is included in room rate as communication charge. Extra data can be purchased online and use of the internet is subject to Oxygen Apartment special terms and condition. The internet service will be terminated for peer to peer file sharing.